While many fans criticize Brock Lesnar's typical matches, Sean Waltman stuck up for his Royal Rumble performance and said he did his job on the most recent edition of his podcast. "He did his role so believably well, and the selling," said Waltman. "And my thing with Brock has always been, I mean since 2002 when he first got to the main roster, I was like okay, this guy is 'invincible' like there has to be a chink in the armor. Any guy, any big monster has to have a chink in the armor, right? So, that was the chink in the armor. You know the corner of the desk of the announcer table and just the way he works is so believable and look he's f'n great okay? Bottom line." After the match, Waltman posted on Twitter: "Brock is great. So is Balor." While most fans would agree with the second part, the online hate of Brock Lesnar is real and Waltman was flooded with negative replies to saying Brock is great. "And when I said so on Twitter 'Oh. My. God. He's great.' I mean people get like insulting with me 'Oh what a joke'... You can say like 'Oh I don't like how he does business' or 'I don't like this or that' but when you don't give credit where credit is due the joke is you," stated Waltman. 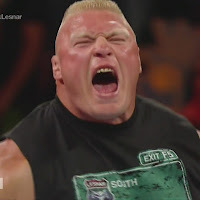 Lesnar's role is to portray the dominant heel champion that Vince McMahon is always fascinated with, and he does a reasonable job at pulling it off. Waltman seems to imply that people can hate the character that Brock Lesnar is representing, but they shouldn't dismiss Lesnar as a performer as he is simply depicting what WWE wants him to be. While Waltman stuck up for Lesnar and was impressed with his Royal Rumble performance, another long-time wrestler was not. During the match Chris Jericho called out Lesnar for being out of shape in a since-deleted tweet which said: "Intimidation and fear goes a LONG way in our business guys. But let's be honest, @BrockLesnar needs to pull up his pants and lose the gut... the dream is over dude. I don't play by the script... @wwe @AEWrestling."